We often come across important stuff that would require us to jot it down somewhere. Sure, a pen and a paper would certainly be handy on such occasions. But then, carrying it everywhere would be troublesome and not to forget, you are adding to the carbon footprint by using paper every time. Many companies have come up with innovations that have allowed people to write and draw things on their smartphones. But, OTM Technologies has gone one step further by introducing Phree, a smartpen that neither needs ink nor paper to write on. 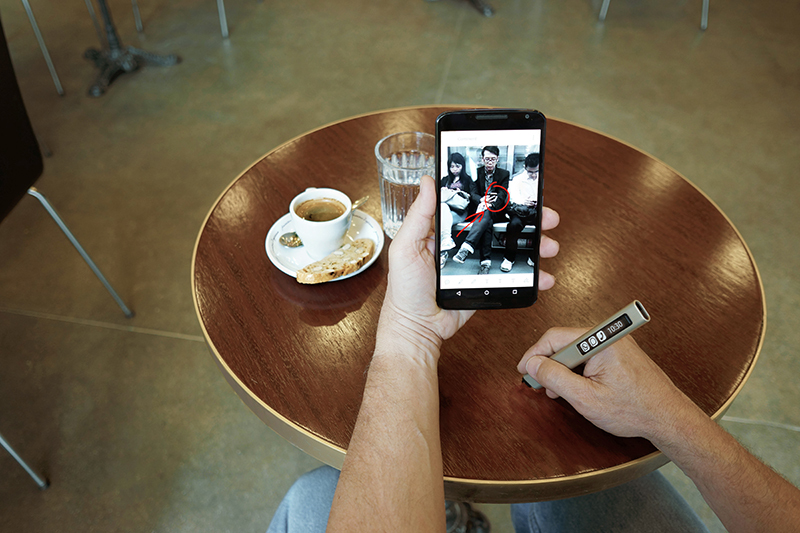 In fact, this smartpen can virtually be used to write or sketch on any surface. Smartpens such as the Pulse Smartpens, Echo Smartpens and Livescribe 3 from the Livescribe stable and Neo Smartpens use paper as a medium to write on and also use ink. Phree goes one step further by eliminating these requirements by allowing you to jot down notes on any surface, be it your hand, your pet dog, the restaurant table or even your car dashboard. It connects easily to tablets, laptops, smartphones, etc. – devices having Bluetooth connectivity. Due to its compatibility with apps such as Evernote, Google handwriting keyboard, Microsoft Office and Viber, you can jot down your ideas, thoughts, notes, sketches anywhere and it will be automatically updated to your connected app without taking out your device. The tip of the pen sports a compact, low-cost optical sensor that works on Optical Translation Measurement (OTM) technology. This technology precisely tracks 3D motion across virtually any surface, in a wide dynamic range. It extracts the motion signal optically and then translates it to X-Y-Z motion information using signal-processing algorithms that run on a very small, integrated electronics component. Thereby, it also provides very high accuracy, up to a distance of about one inch from the object. This ensures the device’s versatility when it comes to its usage on various surfaces. Another interesting feature that comes with this device its functionality as a wireless handset, meaning, you don’t have to take out your phone every time to receive the call. It also sports a touchscreen that displays incoming messages and can be instantly replied by jotting your response on a surface. The company visualizes Phree as an ideal match for augmented reality and virtual reality input and plan to cooperate with companies in this field to show its potential. They are also keen on going into emerging markets like China and India which show a large interest towards technology. They intend to bring the price of the product down through increased production volumes. Check out https://otmtech.com/ for more information.